Chuck Kraus and Ken Pysher serving it up at the 2015 Lions Club Scallop Dinner. One of the longest running annual fall traditions on Shelter Island is the Scallop Dinner sponsored by the Lions Club. ELEANOR P. LABROZZI PHOTO | ‘Adults Only’ took in the school play last weekend. LUCAS at work on a dummy inside one of Shelter Island’s ambulances. The machine is able to apply steady chest compressions while EMTs attend to other lifesaving medical procedures. EMS director Detective Sergeant Jack Thilberg (standing) and Mark Kanarvogel demostrated the automated CPR machine Friday. You’ve seen it on TV — an emergency medical technician jumping up on a gurney administering dramatic chest compressions to a passed out person. Now Shelter Island Emergency Medical Technicians have a tool to more effectively and efficiently administer those compressions. 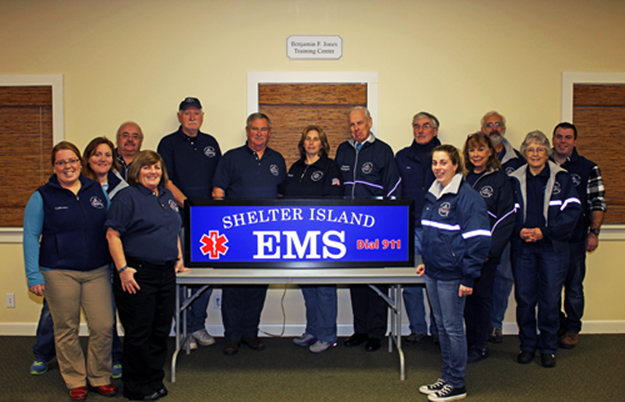 BEVERLEA WALZ PHOTO | Members of the Shelter Island Ambulance Service display their new sign at their headquarters on Manwaring Road. Pictured (from left) are Catherine Brigham, Nicole Strauss, Sam Case, Mary Kanarvogel, Arthur Bloom, Phil Power, Debbie Brewer, Reeves Thompson, Tom McGriel, Tina Rando, Helen Rosenblum, Mark Kanarvogel, Judy Sherman and Anthony Rando.